Quality assurance is of ever increasing importance to health care delivery. One component in implementing a quality system is the periodic, multi-disciplinary, systematic review of a patient's state of health, termed Care Plan. Care Plan Charting is performed by a team of designated medical personnel, including physicians or nurse practitioners, nurses, social workers and dietitians. Various aspects of the patient’s health status are discussed and a set of goals and action items or therapies determined. This comprehensive review will result in guidelines for the patient’s treatment until the next review, and assures that no aspect of the patient’s treatment is neglected. cyberREN's Care Plan facility is well integrated with the entire scope of cyberREN's other medical record management functions. Parts of the Care Plan are automatically populated from entries in other parts of the cyberREN chart. Clinical data to support Care Plan diagnosis and decision-making is automatically presented in the form of a flowsheet on the same display used to chart the patient’s Care Plan. The Compliance Display is also directly linked for diagnostic support. cyberREN offers two models of Care Plan charting, the discipline-centric model and the issue-centric model. Each Care Plan model is configurable and may have different sets of issues/charting- prompts in various treatment modalities. 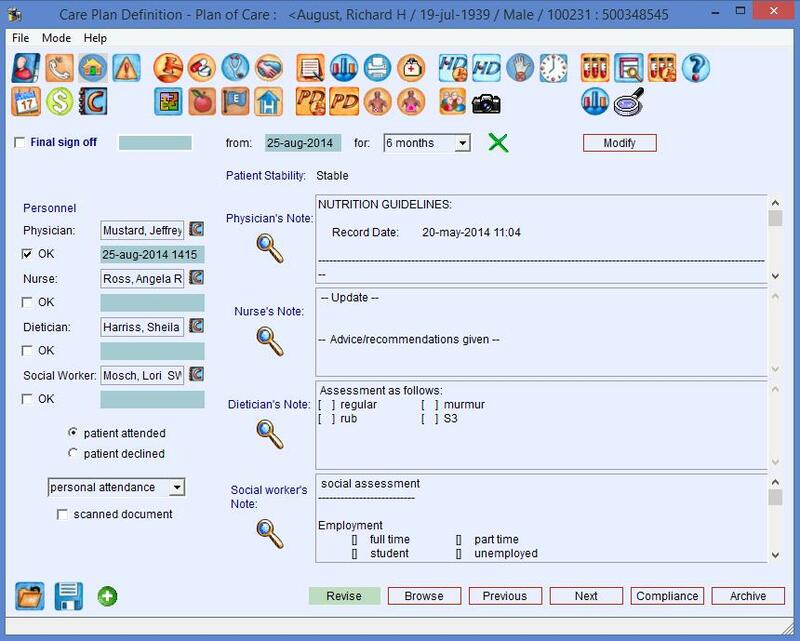 The entire Care Plan charting system is supported by a selection of pick lists and toggles enabling the selection of predefined, standardized items. A catalog of standard phrases may be used by each discipline involved in Care Plan definition, phrases from which can be selected for import into the Care Plan as charted text.